"The complaint was the answer. To have heard myself making it was to be answered. Lightly men talk of saying what they mean. Often when he was teaching me to write in Greek the Fox would say, 'Child, to say the very thing you really mean, the whole of it, nothing more or less or other than what you really mean; that's the whole art and joy of words.' A glib saying. When the time comes to you at which you will be forced at last to utter the speech which has lain at the center of your soul for years, which you have, all that time, idiot-like, been saying over and over, you'll not talk about the joy of words. I saw well why the gods do not speak to us openly, nor let us answer. Till that word can be dug out of us, why should they hear the babble that we think we mean? How can they meet us face to face till we have faces?" I feel inclined to wax a little eloquent (or not so eloquent, as the case may be) on today's quote... so buckle up. 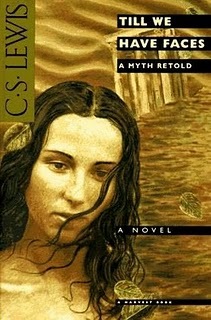 The story is complicated, but to give you a brief summary, a very bitter character comes before "the gods" (the setting is a Greek myth) to give her "noble" complaint about her life circumstances - she feels she has been treated unjustly. However, when she opens her mouth to read her carefully-written complaint (which comprises the entire novel up to this point), her lengthy book has turned into a nasty little piece of paper with ugly writing scrawled all over it, and she simply starts spewing forth what we here in the South would call a "bratty, selfish hissy fit." As she listens to herself say what's really in her heart, she finally becomes aware of her true self and is confronted by her own sinfulness. I've already shared with you about the "sucker punch of truth" effect this had on me when I first read it... It definitely opened my eyes to some of my own sinfulness and failings in areas of my life, and I think every professing Christian should read it. Living an "externally good" life (complete with good deeds, ministry involvement, etc.) while harboring hidden sin inside. "Fixing" and/or pointing out what's wrong with everyone else around you while never taking responsibility for your own sin and shortcomings. Blaming others for what is, in reality, your own fault. Latching onto false doctrines that create false "spiritual loopholes" in an attempt to justify your own sinful behaviors. ...or, in other words, living like a big, fat hypocrite. Our false self-justification and all of the external "good stuff" that we're doing (or, as Lewis puts it, "the babble that we think we mean") doesn't mean squat if "the speech which has lain at the center of your soul" for years is simply a stewing mess of bitterness, anger, hatred, unforgiveness, rebellion, or (insert your own brand of sin here). God looks at the heart, and our hearts are naturally wicked, deceitful, and rebellious. Despite what bumper-sticker worldly wisdom may tell us, it's never a good idea to follow your heart. The human heart (without the transforming power of the Holy Spirit) is apt to lead you into all kinds of evil and wrong thinking....and it certainly will. This is the natural state of the unsaved person, but Christians who have been quenching the influence of the Holy Spirit in their lives can go down the wrong road very easily too.... and the farther you go down that road, the harder it is to come back from it... and the more susceptible to deception you will become. That's why Paul is careful to warn us, "Quench not the Spirit." in 1 Thessalonians 5:19, and why Solomon advised, "Keep thy heart with all diligence, for out of it are the issues of life." in Proverbs 4:23. Because, ultimately, you and I on our own do not have the power to root out that "speech" we have been clinging to and hiding down in the depths of our sinful hearts. That kind of transformation is only possible when we see our own sin for what it is, repent, and are converted by the power of the Gospel and the Holy Spirit to a saving faith in Jesus Christ. That's the first step if you aren't truly saved....and the next step (for the believer), is to remain open to the working of the Spirit in your life, and not to harden yourself to His promptings. Well said. It's a struggle for us all, but even when the change hurts, I'm thankful for it because it means I'm still tender to the Word of God and the promptings of the Holy Spirit. To feel nothing or to have no need to change would be scary indeed. Here's me - jumping up and down excited. Why? Cause I totally love it when God uses someone to talk to me. This post goes along with some other things we've had going on lately, and it's soo good to know He approves and that you're on the right track. Thanks so much for the book recommend. Heading to Amazon now! Blessings!!! Shirley, thank you - it's always nice (and humbling) to know that God has used this blog.... I'm glad it spoke to you today. Thanks so much for stopping by, and I hope you enjoy the book!